Thank you to Simon Jervis and Lenka Cathersides for this research. 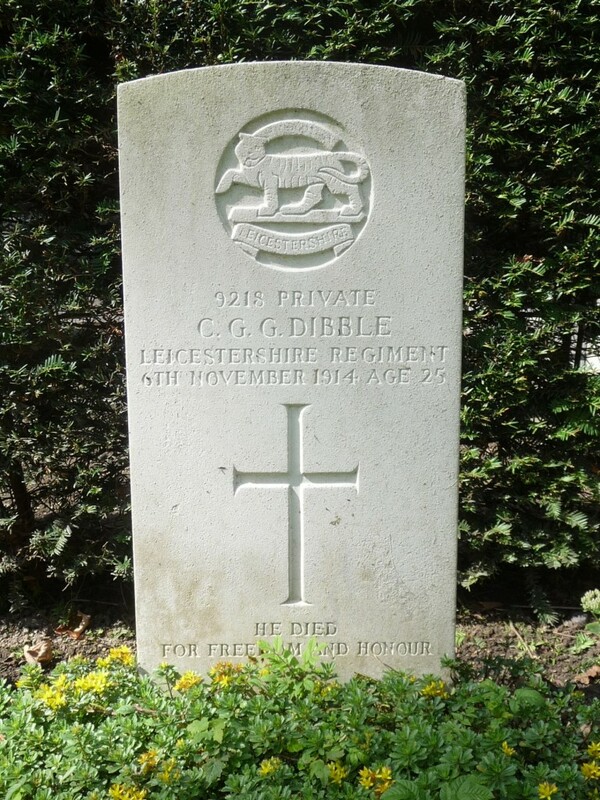 Charles Dibble was born in July-August 1889 in Dorking to Henry William Dibble and Harriet P Dibble. 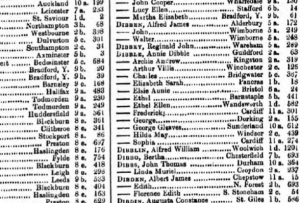 We can see from the 1891 census that he is originally listed as George Dibble, possibly owing to the early censuses being filled out by a third party. In 1891 he is listed to be living with his mother and father and 3 sisters in 18 Mill Lane, Dorking, just off the high street in the parish of St. Martins. The 1901 census has been lost for Charles, but we can also see him to have moved to 2 Falkland Gardens in Dorking before moving out of the area in 1911. 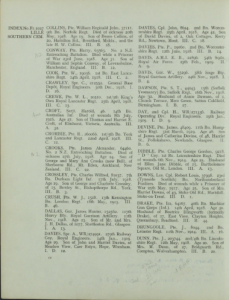 The 1911 census tells us that Charles Dibble has moved to St George, Hanover Square in Belgrave and is living with 21 others, suggesting he is a border at the age of 21. He is boarding with other in his battalion, the 2nd Battalion, Scots Regiment of Foot Guards, also working as a tailor. Charles marries Ellen J Watkins on 1st September 1912 at St Luke, Finsbury in Islington at the age of 23. 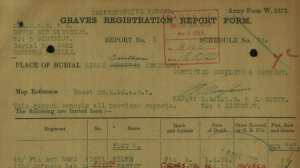 Their marriage certificate tells us they were living together in 15 Bartholomew Square. We can also see that since 1911, Charles has enlisted to the 1st Battalion Leicestershire Regiment, but has also continued to work as a tailor. Ellen was born in 1889 and at the time of the 1901 census is living in Islington with her mother and father, Frank and Louisa Watkins, and her 4 sisters and brother. 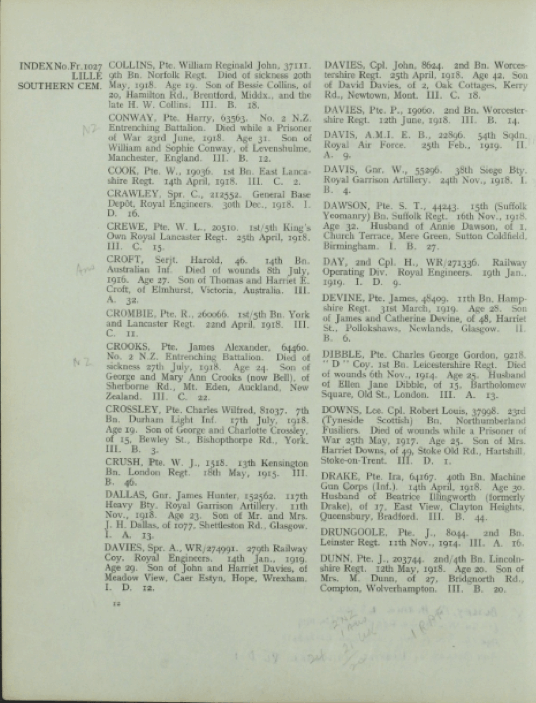 She is actually listed as Helen Watkins, possibly an error when taking the census, but the name and occupation of her father (a goldbeater), as well as her age and address make it clear that it is the same Watkins that marries Charles in 1912. In 1911 she is living in Bartholomew Square with her mother, father and siblings, the house that Charles will go on to move into possibly after he finished training. At this time she appears to be working as a book folder. 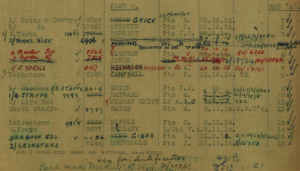 Charles originally serviced as 5944 in the 5th Battalion Scots Guards, his number suggesting he enlisted between 3rd January 1907, and 20th April 1908. He would have undergone military training after enlisting, possibly attending the Duke of York Royal Military School, Royal Hibernian Military School, or the Queen Victoria School. Between 1910 and 1911, Charles enlisted at Aldershot for the D company of the 1st Battalion Leicestershire Regiment serving as 9218. 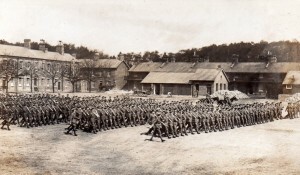 When war broke out, the 1st battalion were based in Femoy, Ireland whereby they returned to Cambridge for training before disembarking on the 9th September 1914 and landing at St. Nazaire on the 10th. 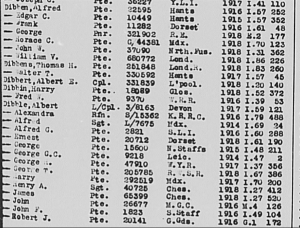 On the 13th they were billeted at Montcerf, and then began their long march to Aisne. Charles would have engaged in the battle at Fosse Marguel, with the battalion’s involvement in the First Battle of Ypres, marching to Rue du Bois, then Armentieres, Bois Grenier on the 19th October. They spent the first months holding this line under terrible conditions and suffering many casualties, and it was between the 19th October and the 22nd November that the first Salient was created. Ypres remained in possession of the allies throughout the war and became an important symbol for gallantry and sacrifice. 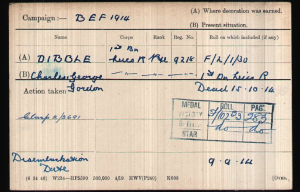 Charles was wounded in the regiment’s first casualties, possibly on the 26th September 1914 and was taken as a prisoner of war until he sadly died on his wounds on the 6th November 1914 aged 25. 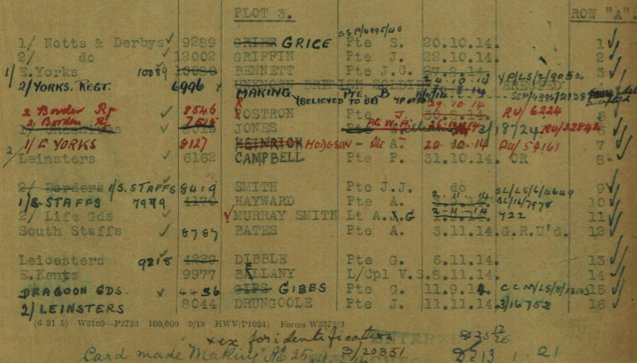 It is possible that he was wounded and treated at Rue-du-Bois, but is commemorated at Lille Southern Cemetery. Lille was occupied by the Germans from the 27th August, and remained in their hands almost completely until the end of the war. It was used by the 39th Stationary Hospital and as the 1st Australian Casualty Clearing Station, meaning Charles could have been treated here. There are 600 casualties commemorated at Lille Southern Cemetery. 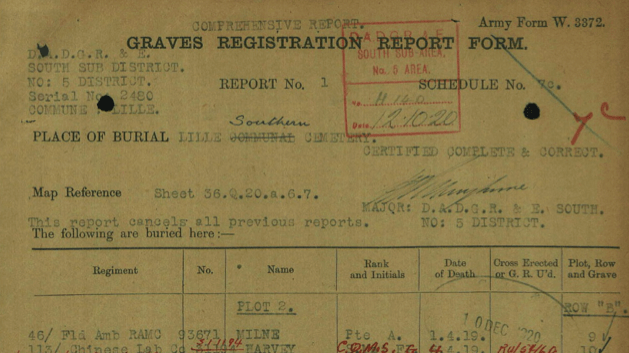 Cause of Death Died of Wounds as a Prisoner of War.